Looking for great deals and discounts on cabins or cottages in Big Bear. Yes, we have all sizes of vacation cabin rentals in a beautiful AAA approved historic rustic mountain resort with pool & spa. Ask about weekday deals on Big Bear group lodging too. All sizes of groups welcome. Limited number of pet friendly cabins with fenced yards where well behaved pets are welcome in our "AAA approved cabins"
WEEKLY, AAA or Military deal. NOTE:some black-out dates apply, call for details. Low cabin reservation rates, fishing, boats available. "Free Day" Weekday special: pay for 2 available nights and get the 3rd night lodging FREE if you can stay for 3 days. Not valid on holidays. Military or AAA discount on any 2 day reservations. Discount vacation offers can't be combined. We are available at 1-800-461-1023 if you have difficulty making a reservation online and you still get the lowest rate. 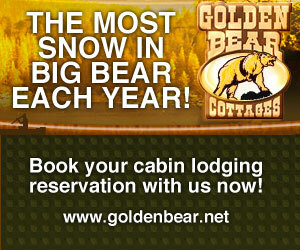 Call for our special deals on Big Bear group lodging too. Limited number of pet friendly cabins with fenced yards where well behaved pets are welcome. Free Pleasure Point Marina boat rentals and local shop coupons. Free local restaurant coupons. Enter promo code AAA3. Then enter the number in your party and your 3 preferred weekdays in the reservation box at the top left side of this page and you will be given 1 "day free". Click on the GO button at the top left side of this page and check as many different dates as you want before you make a reservation.